Sixteen-year-old Peggy is a well-bred orphan who is coerced into posing as a lady in waiting at the palace of King George I. Life is grand, until Peggy starts to suspect that the girl she's impersonating might have been murdered. Unless Peggy can discover the truth, she might be doomed to the same terrible fate. But in a court of shadows and intrigue, anyone could be a spy—perhaps even the handsome young artist with whom Peggy is falling in love . . . History and mystery spark in this effervescent series debut. 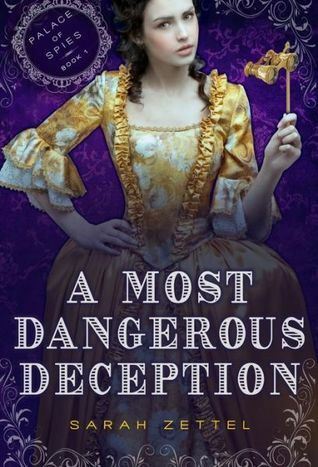 Normally I don't care much for historical fiction, but this one has me curious! Overall just a great synopsis, hopefully the book meets my excitement! I hadn't heard of this one before, but it's SO for me! Thanks for letting me know about it! GREAT pick! I'm not a big fan of historical fiction too, but I actually really like this cover. And yes, her name is cute :D Reminds me of Mad Men! This sounds awesome and I want to read it, but I hate this cover for some reason.